Historian Simon Schama’s latest book, “The Story of the Jews,” is also a five-part documentary series airing on PBS. Schama talks with guest host Frank Sesno about his chronicles of the 3,000-year-old history and what being Jewish means to him. Simon Schama Professor of art history and history, Columbia University. He is the author of 16 books and the writer-presenter of more than 40 documentaries on art, history and literature. His most recent book and documentary is "The Story of the Jews," which airs on PBS in late March and early April. From THE STORY OF THE JEWS by Simon Schama Copyright © 2014 by Simon Schama. Reprinted courtesy of Ecco, an imprint of HarperCollins Publishers. MR. FRANK SESNOAnd thanks for joining us. I'm Frank Sesno, host of "Planet Forward" and director of the School of Media and Public Affairs at George Washington University, and it is my pleasure to be sitting in for Diane Rehm today. She's on vacation. 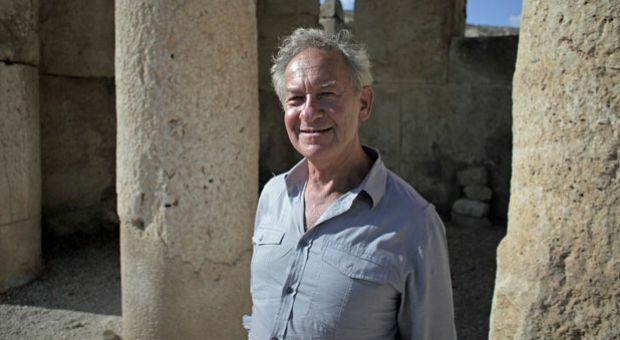 In Simon Schama's latest book and accompanying documentary series that you'll see on PBS, he takes on the daunting task of chronicling the 3,000-year Jewish history, and along the way doesn't shy away from discussing his own personal connection to the religion. MR. FRANK SESNOSimon Schama joins me for the hour to discuss his latest book, "The Story of the Jews," which, as I mentioned, will also air as a five-part PBS documentary series starting later this month. Simon Schama is author of 16 books, professor at Columbia University. Simon Schama, thank you so much for being here today. PROF. SIMON SCHAMAOh, it's a pleasure. SESNOWell, it's great to see you. And I must say, reading the book, watching at least about half of the five documentaries, I am awestruck by the scope and the ambition of this project. SCHAMAI thought you were going to say chutzpah, the entire surprise for me. SESNOOh, that's good. That's good. There's chutzpah there, too. How do you take 3,000 years and call it the story? I note the title is a singular story of the Jews. SCHAMAYeah. Yeah, well, you have to -- in five hours of television, you know, you've got to be very clear and thematic about the great issues which have shaped Jewish identity. And the first one obviously is the creation of a monotheistic faceless formless God. It could be argued that the Egyptians did it first, but that didn't hang around. So there are many -- from that point on, from the point after creation of monotheism, the way in which Jews tried to coexist or failed to coexist with Christians or Muslims, all those great stories provide you with a spine for each of the programs. SCHAMABut I tell you, a deeper and bigger issue, Frank, is that one of the reasons I made the series and decided, you know, to embark on this hubris loaded exercise of writing the history of the Jews was that it seemed to me that this very deeply serious history had -- it is these days always framed either by the Israeli-Palestinian conflict or by the Holocaust or the relationship between the two, not that those two immense issues, both of them tragic in their way, are incidental to Jewish history. SCHAMABut I think both of them have come with, and rather dauntingly, towards people who are not Jewish. The Israeli-Palestinian conflict invites intense polemics on both sides. And the Holocaust, curiously enough, I don't want people to forget about the Holocaust. I'm sitting in the city of the magnificent Holocaust Museum. But it makes people reverential trouble -- non-Jews, I think, worried about, you know, treading amidst the ashes of Auschwitz. So I wanted to give people an access of a bigger, richer, more complicated story in which there's a great deal of celebration, as well as lamentation. SESNOWell, it's interesting because in the opening of the documentary series, you have these different faces, all different colors, and from different places. SESNOThis is a Jew, you say. This is a Jew. This is a Jew. SESNOAnd then you pose the question, what do we have in common? That is a spine. That is a question that you keep coming back to. What do you have in common? SESNOJust as long as I don't get an exam at the end. SCHAMANo, no. I think I've got an antidote. But Diane's taking it. It's called taking a vacation, you know. But I think the issue is the Jews have not been unique in what they've suffered and discrimination and of course not. But they've possibly suffered it more extremely or more intensely or more relentlessly than many other cultures. But where they were unique, and still possibly are, is that when everything else was destroyed, territory -- the usual markers which make people feel secure, territory, land, power, military force, all those things. SCHAMAWhat they did have left was portable writing in the shape of the original Bible scrolls, even sometimes miniaturized into what we put on the doorpost or wind round our wrist. Jews actually invent -- I didn't have a place to talk about this in the programs, but it's in the book. We invent micrographic writing which are tiny, tiny miniaturized writing, so minute you can barely see it with the naked eye. They often formed pictures. SCHAMABut -- so we were kind of suitcase-ready religion in that way. And it's the story itself really, which in some sense, binds us together and with a common memory, whether we're deeply Orthodox or whether we're more elastically Orthodox. And those faces, the Ethiopian lady, the Jewish faces from India, they will share the story. So we go from that moment to the Passover story which is, you know, the founding story even more than the patriarch Abraham that ties us together. SESNOWas this personal for you? SCHAMAYeah. It was. I mean, you know, in Hebrew -- and it's called a teshuvah return. I mean, I wasn't completely, I think, I hope the Prodigal Son. I mean, I haven't ever lost my Jewish identity, but, you know, I wandered a bit, I would say. And so this -- as you get older, I guess, a lot of what you do is, I suppose predictably -- I hope not depressingly predictably -- coming back to where you came from, I guess, like the old elephants, you know. I'm one of those now -- old Jewish elephant -- coming back to the place where you -- which started you off. SCHAMAI mean, Jewish history -- I was born in '45 amidst the ruins of London. There were two histories that have been really smashed about. One was Jewish history, and the other was British history. But both of them have not been annihilated. And so there was already the sense actually that history was a living thing, and it was a instrumentally functionally powerful thing that could keep you going, even amidst horror and extermination. And so it was the first history I was really aware of, the Bible. And so I suppose it's a long journey one took to come back to that, and I suppose I did. SESNOAnd you've done so many histories. I especially loved your history of the French Revolution. That one really connected with me because of my own interests, among other things, at the time. SESNOSo this one's different, though, because it's also your journey and your people's journey. SCHAMAIt's true. And that's -- of course, there are all sorts of warning lights go off and noises. SCHAMAExactly. Exactly. What -- historians take a kind of -- not exactly Hippocratic Oath, but they do -- its' often thought that objectivity and dispassion -- and I'm sure that's right. One needs to have the head, you know, dominating the heart and -- or illusions that you're living in the world of the dead when you're doing it, when you're writing the history. SCHAMABut -- and it's a big but -- and it happened actually at the time I was writing the French Revolution. I thought really -- you know, the thing about the French Revolution, if that book was going to work and the whole experience of translating already a very remote revolutionary time to 1989, when the book came out, I wanted to catch the kind of heat and fire and the sort of -- the exuberance of the language, the intoxication of dangerous language. That's what I felt it was all about. SCHAMAAnd to do that, I actually went back -- before I said yes to writing a book for the 200th anniversary of the French Revolution, I went back to everything that had been written for the 100th anniversary in 1889, in French particularly. And there you had writers who were only two or three generations out from their grandpas and grandmas who had lived through it. And I thought, wow, there's something to be said -- not to be carried away by romantic closeness. But there is something to be said for proximity as well as distance. SCHAMAAnd the Jewish history thing, without being completely self-indulgently autobiographical, I feel -- for me, maybe, just for me, it was never going to work if I was going to find a place of cool consensus, you know, a perfect place of equipoise really. I had to sort of go for it but then kind of rein the personal passions in a bit, but even though I do kind of rein them in a bit. So it may not feel like that from television. And television -- you know this, Frank -- it's such a chilly medium actually. SCHAMAIt's so -- what people do -- the news anchor sit there with their jackets, you know, down at the back of their chair, and you sit there. And you inhabit the language of the sports broadcaster, or the weather forecaster. You're in that aura of news anchor. SESNOWell, the other -- that's right. And the other thing television does -- and film does -- is it forces you into a linear story, into linear storytelling, and makes the ambiguity and the -- all the distractions and diversions very difficult to engage. SESNOSo with 3,000 years of history, that becomes a gargantuan task. You start your documentary with Freud and a fascinating -- a recording as well. SESNOA Godless Jew as you point out. SESNOWhy? Why do you start there? SCHAMAWell, exactly for the reason you've eluded to. I -- the whole project was, in a way, a return. And this was, in a way, Freud's return. He'd never -- though he was a Godless Jew, I'm not quite so Godless as he is. But he was never a shamefaced Jew. In fact, he upbraided Jews he thought were skulking around Vienna pretending to be something else. And so he was very forthright in his Jewish identity. And the more the Nazis closed in on him in psychoanalysis, the more emphatically Jewish -- chewing on his cigar -- he became. SCHAMABut it was very touching that when he moved to London where we pick up the story in the very last years of his life, what he wanted to do before he died was write in his slightly crackpot way the origins of the Moses moment. And he wrote the bizarre but moving book called "Moses and Monotheism" which had a bizarre view of how Moses chose the Jews, Moses as the last priest of the cult of Akhenaten. SESNOSo what does that tell us? What did that tell you about the story of the Jews? SCHAMAIt tells -- what it did was to connect modernity with remote antiquity. And I wanted to say -- thank you for pulling me out. I wanted to say, you know, we carry this ancient story around in all of our modern bodies, if you're Jewish. And I did also -- when I got the production team together, I said, OK, this is not going to be -- this is going to be a backlit camel-free series. I do not want to start with the backlit camel plodding over the sand. I said, I want people to be slightly startled and see that actually this ancient, ancient history always replays itself in the modern world. So that's why we went with Dr. Sigmund. SESNOAnd that's your story. That's that story, that replaying of that story, is what you're saying. SESNOWe're talking with Simon Schama. He is author of "The Story of the Jews" and five-part PBS documentary. Upcoming, we'll be back with more and talk with you and your questions in just a moment. SESNOAnd welcome back to "The Diane Rehm Show." I'm Frank Sesno, sitting in for Diane today. I'm talking with Simon Schama, professor of art history and history at Columbia University, author of 16 books, writer and presenter of more than 40 documentaries on art, history, literature. His most recent book -- and this is what we're discussing today, and accompanying five-part documentary -- is "The Story Of The Jews." It airs on PBS in late March and early April. SESNOSimon Schama, talk about your own background, your own Jewish background. You're quite religious. Your family -- did you consider themselves or did your family consider themselves Jewish-English, English-Jewish, what? SCHAMAWell, wonderfully, the considered themselves both. My father, I remember, on his bookshelf -- he was born in London. His father was born in Romania. And his grandfather was born in Turkey. So there was that. The Schamas ultimately came from Izmir, in Turkey. But on his bookshelf, I remember Churchill's "History of the English-Speaking Peoples" was next to Chaim Weizmann's "Trial and Error." SCHAMAAnd my father thought there was, in some extraordinary way that those two identities were indivisible. The Jews -- English Jews, well, British Jews were very lucky to have ended up where they were or they would have suffered the fate of our, you know, cousins in Vienna and so on. So he was very much into language. He used to tell me that a Jews best weapon is his mouth. He was a great storyteller. He would read to us Dickens, really, twice a week. SESNOMalcolm Gladwell is right, this is where your 10,000 hours came from. SCHAMAProbably true. But he was a chatty Jew, my father. His Jewish identity, and my mother as well, meant a huge amount to him. We kept kosher at home. We went to Shabbat. We went to Shalom and Shabbat, but I also went to Hebrew school. I taught in Hebrew school for a little bit, Chumash, the first beginning of the Bible, to kids. And so these two things were really, you know, my father admired Churchill as a great orator. But for him it wasn't just simply ornamental speech. SCHAMAHe was a soapbox orator at the time of the British Fascists, the black shirts. And he was beaten up quite a lot for it in the East End, including on the famous Cable Street Black Shirt March. But he was very round and he bounced back from those things. SESNO…of identity go all the way back to antiquity? SCHAMAWell, I mean, yes. You don't want to say that Jews -- I mean, because we don't even know if the sort of story is historically true, of course. Actually, what we do know, archaeologically, is that there's some singular kind of identity, which isn't the same thing as (word?) around the 11th century. That's why both the first program and the book concentrate on this extraordinary site called Khirbet Qeiyafa, in the Valley of Elah where the Bible tells us David and Goliath had their battle. SCHAMAAnybody out there not been to Israel and interested, that is a really wonderful site to go and see. But the thing is that I don't want to say that, you know, Jews came fully formed out of Judaean Hills really, with a sense of what made their religion and their identity distinct. It sure didn't. So the book really is able to go in in more detail, as books usually can. The long, long period -- there was a long period when, you know, that Commandment, "Thou shalt have no other Gods before me," presupposes there's a line of other ones with whom you're flirting. SCHAMAAnd that was historically true. Thousands of images of God's wife, of Asherah, holding her breasts as a kind of fertility half-goddess, are found all over Palestine. So the kind of biblical sense in which we abandoned all other gods is not historically true, but there's a point at which when the Bible is written three centuries or four centuries after the events it purports to describe, there is a strong sense of separating yourself out from the Mesopotamia and Egyptian and Philistine world. SCHAMASo it takes a very long time for this what we think of as biblical self-consciousness of separateness to actually establish itself. And the book is really a celebration of the ambiguities of never being quite as separate as you imagine you are. SESNOOne of the themes that comes through again and again is what has allowed Jews to survive. SESNO…thousands of years of persecution. You say it's words, books, oral traditions. SCHAMAYes. I think that's -- I'm not even sure it's a controversial view, but it's certainly is in that you have a sense really that you have a special possession, which is partly a set of rules for living, which is what the early Bible is, norms, what you shall and shall not do. But you also have a set of extraordinary stories, where people talk back to God. Job talks back to God. Jonah complains, you know, to God, why me, why now, can't you possibly even damage the Ninevites just a little bit, given I've been three -- spent my weekend in the belly of a large fish? SCHAMAAnd it is a large fish, dagh gadhol, by the way, not a whale. If it was called Jonah and the marine mammal that wouldn't be -- so, you know, this is very special and it's what, I mean, you find the story of the Jews is at this core of the Bible, but it's so many other stories as well. One very moving thing, which we didn't, again, have time to do in the film, but is in Volume Two, which I'm writing now, is the story of a man called Emanuel Ringelblum, who is historian, also kind of godless, but who'd been kind of a historian of the polish community, Yiddish-speaking communities. SCHAMAAnd he was stuck in the ghetto in 1940 and knew he wasn't going to make it out alive, but he gets a group of students, really, together, called the (word?) Shabbos, which means the kind of community of the Sabbath really. And he collects the daily documents of life in the tenement apartment blocks, as it becomes more and more and more hellish. And then hides them in milk churns and buries them because he knows he and his friend, Israel Lichtenstein, knows that they'll be discovered. And they are dug up by one survivor of that in 1950. SESNOWhen were they discovered? 1950. SCHAMA1950. And then there's one left, we think, underneath the Chinese embassy in Warsaw, but guess what, I don't think the Chinese are about demolish their foundations. SCHAMABut that's very moving, because he then said, I want posterity to understand this part of the story, too. SESNO…we can see from the Dead Sea Scrolls. They've been around. We've all known about them. But seeing them and seeing how clearly we can see these bits and fragments of writing is just fascinating. Was is it as gripping to you being in the presence of those documents, as it is on the other end? SCHAMAYeah, it really was. I think actually -- I mean, I've seen them, you know, behind glass at the wonderful (word?) Book of the Shrine in the Israel Museum. But there was something about filming in Qumran, where they were originally discovered first in 1947, these extraordinary 700-odd manuscripts, and then going to the lab, is electrifying really. Because you really do feel the hands of the scribe moving over the papyrus and the other media which, you know, vellum and animal skin and so on, on which they're written. SESNOWell, you -- I think the character of the woman you were talking says -- or you said, I forget which now -- that a sixth-grader could read that. SCHAMAYes. Absolutely. Children come in and it's identical to the language. I think only Tamil, really, is as unchanged, as both are spoken in the written language from that degree of antiquity. So you see them really, this bunch of kind of, you know, self-illuminating scribes really. Not just writing the entirety of the Bible is there, with the exception of the Books of Esther and Nehemiah, but adding to it. SESNOThat's been known to happen. I'm not sure in that particular case. SCHAMABut, yeah, I've made a living out of this, Frank, actually. But people, alas, always surrender. SESNOTalk about Josephus, the man who documents the sacking of Jerusalem by the Romans, which you convey in a very dramatic and real way. SESNOAnd you see it -- actually you tie it back to Freud many years later, right? SCHAMANo, no, it's fine. But we do indeed. Josephus is extraordinary because -- for historians in particular. Not just because he's our only source, still, as a first-hand witness of the immense revolt against the Romans, but he's sort of an ideal historian, in a way. He's thought of -- when we were growing up as little Jewish boys, the crucial fact to know about Josephus is that he is a general on the side of the Jews. And then he's in a siege where he encourages everybody to commit sort of suicide. And then walks out alive and joins the Romans. SCHAMASo you think, oh, there's a terrible moral stink above his tomb, but the fact is precisely because part of his identity is profoundly Jewish, one side of his family were Hasmonean royal aristocracy, from the kings of Judaea. The other half were priests of the temple. So you couldn't get more Jewish. And his original name was Joseph, son of Matthew, Yosef ben Matityahu. SCHAMAAnd because he becomes adopted, as a kind of tame Jew by the emperor of Vespasian, who's fighting the war and his son Titus, he calls himself Flavius Josephus, after the ruling. It's like, you know, I don't know, being, I don't know, a British loyalist and then calling yourself Washington and joining the Continental armies. So the opposite from Benedict Arnold. So you think -- but that gives him, of course, extraordinary insight into both sides of this violent phenomenon which is going on. SCHAMAAnd it makes him -- he's a brilliant orator. I mean, he's unsparing and brutal and fierce, but there is something very moving -- I promise cut a long story short -- yeah, yeah, you say. When he's living in the emperor's apartments, he's not just -- he's moved to Rome, he's married the woman whom the Romans have chosen for him. He finds all the Romans holding their noses at this Jew. SCHAMAHe expects to be welcomed and he's not. Guess what? This has happened since to many Jews. So he decides to get on his feet, as I say in the film, and say I'm going to write a different kind of book. I'm going to write a book which will disabuse you of all the disgusting prejudices you've held about Jews. And I'm going to tell you what the Torah says. And in one very moving way, he said, we have become, you know, a reed in parenthesis. SCHAMAWe've been robbed of everything, you've taken our treasures, you've destroyed our temple. We have become the teachers of man in the greatest number of things. And that, to me, is profoundly moving because it's an unapologetic declaration of dignity. SESNOI'm Frank Sesno, and you're listening to "The Diane Rehm Show." And we're talking with Simon Schama. If you'd like to join us, call 1-800-433-8850 or send us an email at drshow@wamu.org. So, Simon Schama, you have been working on this project for four years, you said, five years? SCHAMAYes, I would say, yeah, five years. SCHAMAThe book as well. And it's not over yet, yeah. SESNOYou're a remarkable historian. You have, you know, you grew up with the great Jewish tradition around you. What did you discover over this course of these four or five years that you didn't know or that you didn't appreciate or that really took you aback? SCHAMANo. I'll tell you. You know, when I began to think about the whole possibility of what it would do on television, I thought, what I've got here, because of the wordiness of the Jews, is great radio. And then, you know, then I went for a day trip to -- when I was doing (word?) locations to this place which we show at the beginning of the second program, called Tzippori in Hebrew, or Sepphoris in Latin and Greek. SCHAMAAnd this is a Jewish city in Galilee, about six miles outside Nazareth, where a famous Jew came from. And it's covered in mosaics. And it -- including the synagogue. The mosaics don't just belong to pagan Romans and Greeks. These are Jewish houses and a synagogue itself has a mosaic floor of spectacular beauty, even in its half-ruined condition, including not just birds and beasts and memories of the temple, but the faces and bodies of people from the Bible, and the four women. SCHAMAThey're sort of basically pin-up girls who represent the four seasons. And I began to think a lot -- and it was sort of a duh moment. Because there are brilliant historians working on Jewish art, you would think Jewish art would be one of the shortest topics really in the history of histories. But it isn't. It turns out that images play this -- notwithstanding the second Commandment, "That shalt have no graven images." That turns out to be a prohibition on sculpture, essentially, idolatry. SCHAMAAnd it turns out that images have played a really fundamental part in the shaping of Judaism. SESNOAnd that you didn't appreciate. SCHAMAThat I hadn't quite taken on board with all the kind of attentiveness I should. And it makes for better television. SESNOWhen you visited Cordoba, in Spain, I understand that was a particularly emotional moment. SESNOAnd not one that necessarily translates on television, but for you, tell me about that. SCHAMAWell, I think because Cordoba, it was the place where the great philosopher Maimonides was born, but mostly Muslim Spain was one of those -- there were massacres, there were slaughters, there were bad moments, but nonetheless -- I don't want to say it was exactly a honeymoon between Islam and Judaism, but it was whole lot better than what you could expect in Christian Europe at that time. There was no slaughtered God to prosecute the Jews for sacrificing. SCHAMAAnd the Jews lived as second-class citizens, but they lived on terms of true co-existence with Islamic culture. And there's a slightly, probably embarrassing sequence in the program where I'm reciting Hebrew poetry in English, which really would not have happened. And it's a poetry of both love, worldly love, sensual love, as well as love of God. That couldn't have happened, without the example of Arabic Muslim poetry. So for me, the coming to an end of the Jews' presence in Spain, both in Muslim Spain and Christian Spain, is a terrible cultural catastrophe really. So it's both beautiful and poignant, that sequence. SESNOAnd for those who aren't very familiar with this, give us the sense of history and time when that took place and over what period. SCHAMAOh, well, you know, the conquest of Spain is -- I'm going to get this wrong, embarrassingly, but it's 9th -- the great period, the flourishing is from the 9th century A.D. and Jews are expelled from what's become Christian Spain in 1492. For Jews, 1492 has a non-Columbus, catastrophic resonance. So a long period of really flourishing, as kind of, you know, negotiators between many different cultures. SESNOSimon Schama, author of "The Story Of The Jews." And our tour guide, really, through a remarkable journey in the five-part PBS documentary. We're going to come back and we're going to invite your questions. Several of you are on the phone lines already. 1-800-433-8850 or send us an email at drshow@wamu.org. You're listening to "The Diane Rehm Show." I'm Frank Sesno. When we come back, you join the conversation. SESNOAnd welcome back to "The Diane Rehm Show." I'm Frank Sesno sitting in for Diane today. Our guest, Simon Schama. He's author of "The Story of the Jews." He's the host and a journeyman of the five-part PBS documentary series that accompanies this, which will be airing later this month and early next. We want to go to your questions, your calls now for Simon Schama. And let me start, Simon Schama, if I may with a couple of emails that we've gotten here. SESNOHere's one from Priscilla. "Your interview was fascinating," she says. Well, thank you all very much. It's all because of you, Simon Schama, "but will your work cover any of the Messianic movements that have taken place in Jewish history? SCHAMAYes, it does. Thank you very much. It does -- this is a horrible weasel reply to your terrific and astute inquiry, Priscilla. Volume II, that's to say (unintelligible) does not (unintelligible) which is -- who was the fourth Messiah of the 17th century. The book concentrates very hard. The chapters on Kabala (sp?) which sound -- it sounds they're very interested in that, occur essentially in the second volume. So I hope you stay with that. SCHAMABut Jews are caught between this kind of daily routine, you know. The Jewish religion and the Torah gives you rules for living every week. It's a sort of socially active religion, but it's also very -- it's always from very early on and the Dead Sea Scrolls are a good example of this, has this ferociously romantic starry-eyed heaven-scanning wish that a Messiah would come. And the Messiah in the Jewish tradition, I want you to be absolutely clear, is not a god. SCHAMAThat was part of the problem with Jesus of Nazareth. The Messiah is a mortal human being who's going to kind of liberate Jerusalem and bring about, you know, good times. But he's essentially made of human stuff like you and me. And that caused problems in the middle ages. SESNOWe'll go from the middle ages to a very current question. This is Alan's question. "How do the rather surprising findings of the recent Pew study of American Jews," he asks, "such as the relatively high percentage of Jews who don't feel that the belief in God is necessary to be a Jew fit into the continuum of this story of the Jews?" SCHAMAWell, I think, you know, the pessimistic view is that the Jews are doomed to disappear really between those who are defiantly godless and those who are ultra orthodox. But this has been said for thousands and thousands of years. SCHAMAYeah, really. I mean, there are arguments about actually exactly where you draw the lines about what is, as it were, sometimes literally kosher or not. For instance, if you read the book of Leviticus, locusts are kosher. They're little crunchy birds. If you read Deuteronomy, they are so not kosher. So the (unintelligible) is an enormous book of such arguments. SCHAMASo where exactly do you draw the lines? The fat -- Judaism is a much squishier religion than you might actually imagine -- leaves the possibility of deciding where you -- I mean, my parents would be horrified by any Jews who would drive their car to synagogue. Yet the parking -- the synagogue car park is a contradiction in terms actually in Britain and many places. SCHAMASo this leaves a huge area for Jews who are constantly questioning exactly how Jewish do you have to be to move into. SESNOLet's go to the calls. Mike from Dallas, Texas. Hi, Mike. Go ahead. MIKEI find so good to talk with you. First of all, congratulations on your book, Simon (unintelligible) . MIKEAnd I have a question about an interesting thing that I heard. I have written my own understanding of Jewish history and probably am the first Muslim in the world to commemorate holocaust in Dallas for the last seven years to develop an understanding of what transpired and how we can build bridges between people when people are down. MIKEI'm really proud of that accomplishment. MIKEAnd there is an article actually at Huffington Post, Holocaust and the Muslim Guy. SCHAMAOh, I will look for it. Thank you so much. SESNOYeah, go ahead with your question. MIKESo the question is, you used the phrase suitcase religion, and I can understand that. You know, just trying to make it home in Germany, Hitler described them trying to make a home in Spain. That was destroyed. Well, people don't feel secure drop their guards. And this is the first time that I heard this phrase to express that so well. Could you elaborate on suitcase religion? SCHAMAWell, it's just that you're never quite sure -- you know, most people feel that they are fixed when they find a home to go to. For example, Jews were not allowed to own land in many cultures. And that, you know, already took away one of the ways in which you felt rooted. And Jews feel rooted to their religion, to their sacred books, to their words rather than to territory. And you'll know that, you know, one of the most -- the fiercest argument going on in Israel right now is those who are obsessed with acreage. And that's not my view at all. SCHAMAAnd those who say, well, the heart of being Jewish are recessive ethics. And, you know, this sort of argument has gone on a very long time. The suitcase always, not only took my most precious belongings, but the most precious of all, mainly the writings that kept you Jewish. So it's both tragic and conciliatory at the same time. And Jews are not unique in having had this, but they've just had it to a very extreme degree over the millennia. SESNOOmi joins us now on the phone from Miami, Fla. Hi, Omi. OMIHi. I'm Israeli American and as a Jew, for the first time in 2000 years, we have a thing called Israeli. We haven't had that in a very long time and now we have a whole new generation of Israeli Americans that are very young now but they're growing in numbers. Do you touch on this in the book? What do you see is going to be the future of this Israeli-American generation? SCHAMAWell, I haven't got to that moment in the book, actually. Is it Omi, your name? I'm writing my way into the 20th century, so you'll forgive me. But I will think about it because actually you're absolutely right, it's not -- I'm glad you made the call because actually in a way Israeli-Americans are in a perfect position to bridge the Diaspora with Israel. Most of us think about ourselves, in my case, as a (word?) , you know, as a Diaspora Jew who passionately committed to Israel. But not always invariably uncritical of it. SCHAMASo you are in a -- you were born in Israel, were you? SCHAMAOh, we've lost him, okay. But, you know, an Israeli American ought to be a negotiator really between the world of Jews outside Israel and the world of Jews within it. SESNOOne more here from Rondi in Winterville, N.C. Hi, Rondi. RONDI...is basically a Jewish book. My question is, other then what I think is a figurative description of the deity Jesus, a revelation, do you have any insight whatsoever due to your event's research whether Jesus was tall, short, skinny, et cetera? SCHAMANo. No, unfortunately. He didn't take a selfie. Actually I don't mean to be trivial facetious about this. No, we don't know. I mean, you make a -- what's very important about Jewish writing is the invisibility of God, which is not the same thing as Jesus. But what is extremely striking, if you think about other pagan religions in particular who were very concerned to give a face to their various deities, whether it was in Egypt or Greece or Mesopotamia. The Jews come up with this idea that really you can't see God, that he's in some absolutely untranslatable way, not like a human form. SCHAMASo they wouldn't have been paying attention very much to what Jesus actually looked like. And, you know, the sense in which he always conventionally appears in movies or wherever as Willem Dafoe or, you know, someone with long dark hair and a little beard is completely fictitious of course. SCHAMAWell, you know, the book -- and it's two volumes, it's long enough -- so this is again a slightly feeble excuse -- but he's not central. Some poor and early Christians on what they make of Jews is very fundamental to the book in particular, and to our second medieval film because as your last caller said, essentially Christianity initially is a kind of Jewish sect. And then it becomes something that's available to everybody. SCHAMAAnd Jewish rituals like the dietary rules and particularly like circumcision become an obstacle. And Paul's great -- the thrust of Paul-ine preaching is not hostile to Judaism but it needs to uproot the specifically Jewish aspects of Christianity and take them out of it. And that creates -- that does cast, in my view, a shadow over whether or not Jews can lead a normal life inside a Christian world. SESNOHere's an email from Ellis. "The Jews touched about every civilization across the world," Ellis writes, "Egypt, Mesopotamia, Persia, Greece, Rome, China, Spain, Czarist Russia, Germany, etcetera. SESNOAnd survived them and continued to thrive and flourish in the sciences, letters, music and art. How do you account for this?" SCHAMAWell, I think again it goes back to the question we talked about a bit, saying when you have the kind of physical material world of power taken away from you, you need to really cultivate that piece of human existence above the neck. That's to say that this is Freud's own conclusion that what the Jews bring to civilization is an intense valuation of the life of the mind, is a kind of reflective existence, and the kind of unquenchable belief that in human reflection and meditation, spirituality, the world of the intellect, the world of the arts, you can flourish even if you are physically threatened. So, you know, that travels down through the generations. SESNOAll right. Another caller here. Lance joins us from Port Orange, Fla. Hi, Lance. LANCEHi. I really appreciate you taking my phone call. So I'm Jewish and I'm a very skeptical person. And I -- you know, what I appreciate about -- and I'm sorry, I just tuned in. I didn't get your name, the author. LANCESimon, you know, you bridge for me my spiritual side and my Jewish side, you know. And I'm kind of wondering, you know, how you substantiate some of the facts that you talk about because I'm always skeptical of -- you know, everybody talks about this is that way, this happened this way. And I'm -- you know, how do you substantiate, you know, what -- your knowledge? And, you know, you spoke in the beginning of the program about, you know, there was some facts archaeological. You know you can't really argue that, you know. SCHAMAThat's right. Well, you've answered your own question I think, Paul (sic), actually. There are documents and documents sometimes will be olive pits. For instance, how do we know that the site I talked about at the beginning of the program, which turns out to be a Judean fortress of the 11th and 10th century is really that old? And the answer is, it was strewn with olive pits, olive stones, which can be carbon dated -- staggeringly carbon dated within about 50 years. SCHAMAThis is a truly extraordinary thing. How do we know, for example, that silver amulets inscribed with lines from the Bible that were found in a burial cave on the edge of Jerusalem really belonged to the period of the last 5000 years of the Jewish kings? Answer again, you can -- in terms of the physical science, you can again date them very accurately to the very late 7th century B.C. So, you know, it's possible to subject all the stories that Jews have to this kind of analysis. SCHAMAAnd, you know, we're not just wandering around in a mist of conjecture. That's what separates an anecdotalist from a historian. I don't mean to sound horribly professorially grand, but that's the truth of it. SESNOAnd the professorially grand is Simon Schama. We're talking with him. I'm Frank Sesno and you're listening to "The Diane Rehm Show." And if you want to join our conversation, 1-800-433-8850 or an email to drshow@wamu.org. Simon Schama, I want to talk to you for just a minute about another of the great crossroads that you encounter and occupy in your work. And that is life for the Jews in the enlightenment -- in this enlightenment period, which really is an inflection point in many ways. Talk about that. SCHAMAYeah, this begins in the 18th century -- it really gets going in the 18th century. And it beings really with a kind of overture on the part of the Christian world or the non-Jewish world in Europe. And the line is like this, well, you Jews have been, you know, secluded and we've been part of the problem. We created the ghetto, not you. But you've been sort of shut up in your own sense of separateness. Try coming out of this world wearing our clothes, talking our language. We're not asking you to abandon your religion. Be part of our culture and in return we'll give you equal citizenship rights. All the disabilities, all the persecutions, all the oppressions will stop. SCHAMASo in the large part of Europe, but especially in Germany -- especially in Germany where this deal to be a good one, Jews did exactly as they were bidden. And there's a marvelous man called Moses Mendelssohn, who's the grandfather of the composer Felix Mendelssohn, who exemplifies this. He's intellectual partner over the playwright called Gotthold Lessing, who then makes Moses Mendelssohn the hero of his drama, not Sheiloch (sp?) but Nathan the Wise. SCHAMAAnd they together embark on this kind of cousinhood. And so, you know, everything looks really promising before it stops looking promising. SESNOWe have time for one last question. Michael from Fayette, Ala. How are you? Go ahead with your question, please. SESNOMichael, I don't want to cut you off but we're very short on time so let me ask you to cut right to the question. SESNOOkay, Michael. We're very short on time. I'm going to let Simon Schama try that briefly. There's a lot. SCHAMAWell, I would say watch the series actually. It's not the answer, but it sort of touches on both of those things. Judaism can never be about T-shirts. Instead, I don't know, you know, read some of the great Jewish writers, not just the -- read (unintelligible), read the Great Isle Parrots. Saturate yourself in them and forget Jerry Seinfeld. SESNOSimon Schama, in the 15 seconds left, all this work, all this reflection. How has it changed you as a person, as a Jew? SCHAMAIt's made me convinced that being Jewish is a special gift and a special burden. And you get to tell good jokes. SESNOAnd you get to tell incredible stories. Simon Schama, "Story of the Jews." Thank you so much for being with us today. SESNOI'm Frank Sesno sitting in for Diane Rehm. Have a great day.